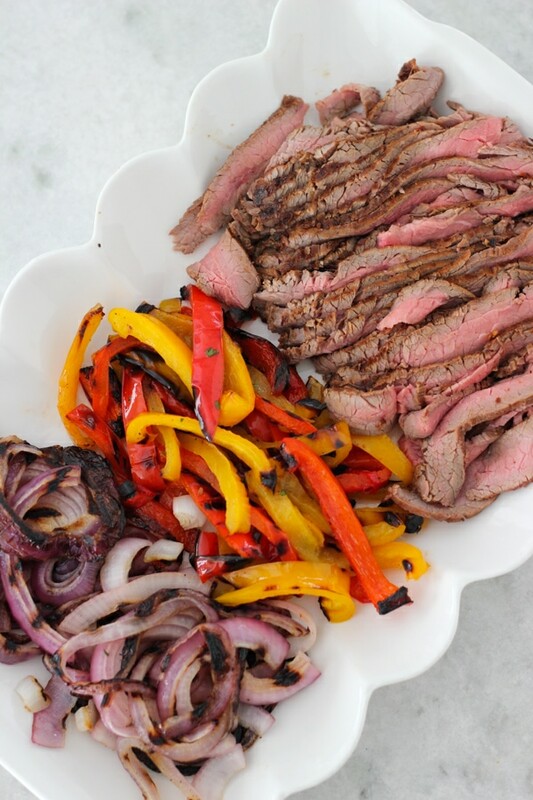 During one of my weekly meal planning sessions, I suddenly got a craving for Beef Fajitas. I don’t even know why, since I’ve never made them at home before, but it just sounded good. I was fully expecting a plain and simple dinner for just Sergi and I, nothing glamorous. In fact, I forgot to check our pantry and it turned out that we only had one lonely flour tortilla. That would never do, and since going to the grocery store with a baby is a very involved commitment, I decided to just make them from scratch. How hard could it be, right? 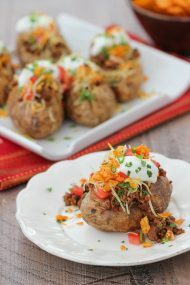 After looking at tons of different recipes on Pinterest, I found one that caught my attention. Boy, oh, boy! This simple dinner knocked our socks off. I almost felt reverent eating it. Every component was so fresh, perfectly paired and just screaming with flavor. The homemade tortillas really made it extra special. The juicy strips of steak, grilled peppers and onions that have the perfect amount of sweetness and are nice and crisp, along with so much fresh flavors from the Pico de Gallo, Guacamole and cilantro – all of this wrapped up in that warm tortilla almost brought me to tears. 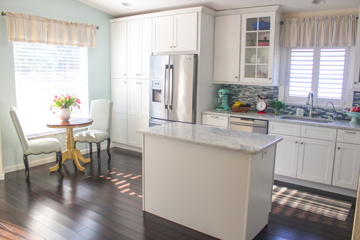 Of course, I vowed to make this next time we had our family over our house. 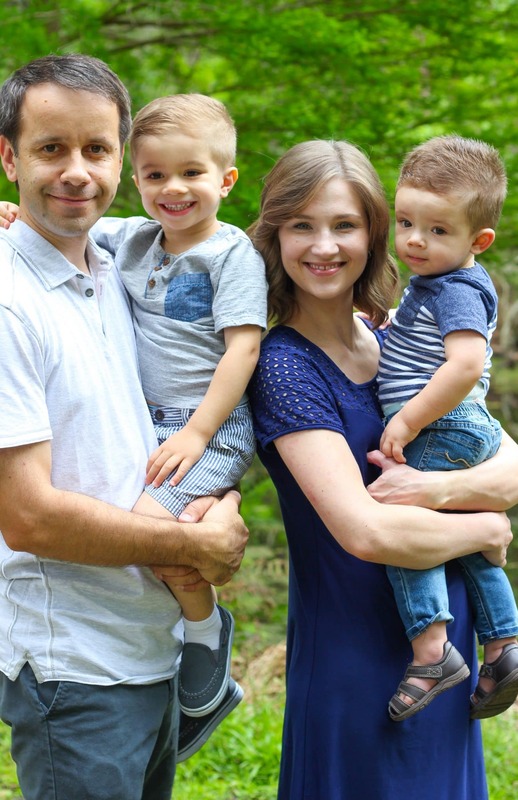 On Memorial Day, we had a fun family party and I was thrilled to share this with them. I was not disappointed with their reaction and the Beef Fajitas were the star of the show. I was only too happy to make this dish again and document the whole thing for the blog, step by step pictures and all. I hope you enjoy. We will certainly be making this over and over again. 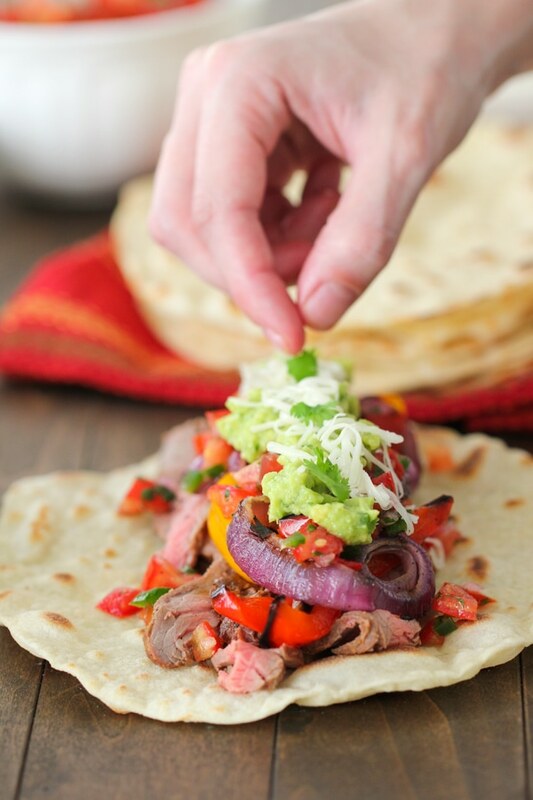 You can use store bought flour tortillas or make tortillas from scratch. I used this recipe that I found on Pinterest. This is definitely not an authentic Mexican recipe, but I don’t care – the tortillas taste SO good. It’s surprisingly easy to make tortillas at home. 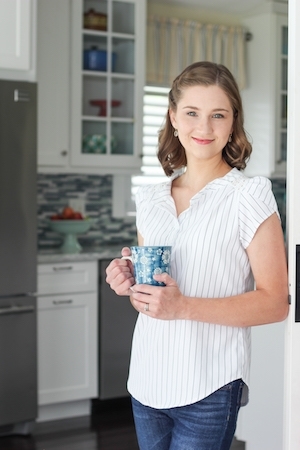 Another benefit is that you can make a large batch and store them in your freezer. 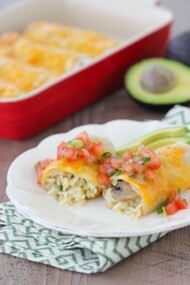 You will only need half a batch of tortillas for this recipe, but I usually make a full batch and use the second half of tortillas the next morning to make Breakfast Burritos. 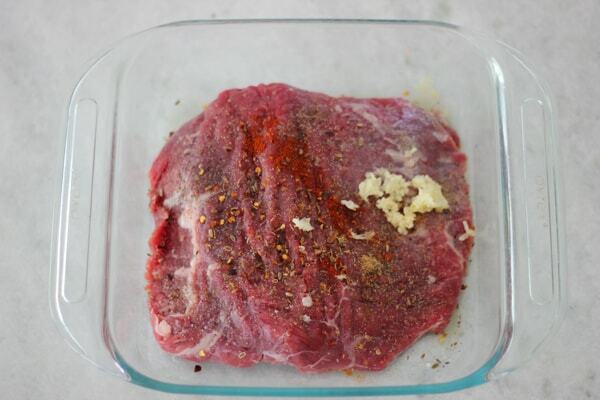 Marinate the steaks in the olive oil, lime juice, ground coriander, paprika, dill seeds, crushed red pepper, ground black pepper, salt and garlic. 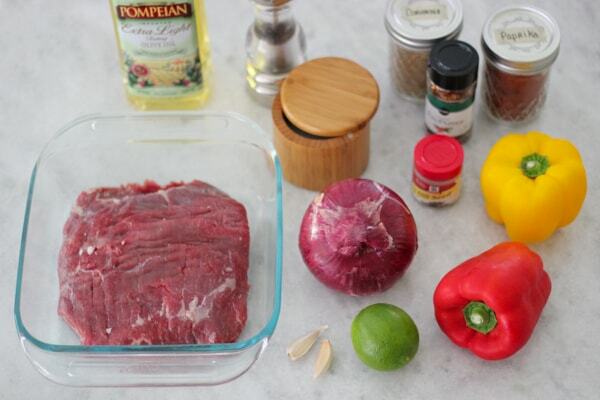 Make sure the entire flank steak is coated in the marinade. Set aside for at least 15 minutes and up to 4-6 hours in advance. Prep the veggies next. Cut the peppers on each side, so that you end up with four pieces from each pepper. Discard the seeds and tops. Cut the onions into thick slices. 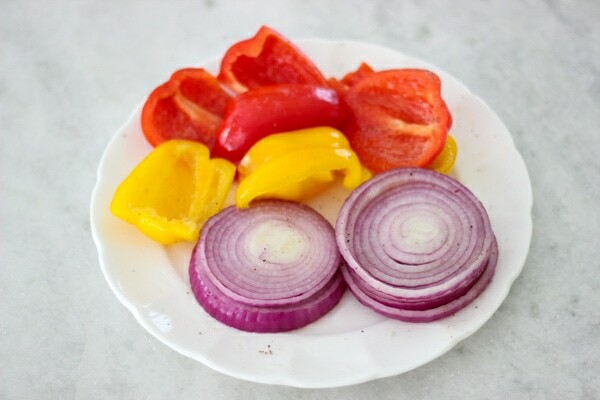 Brush the peppers and onions on both sides with olive oil and season with salt and ground black pepper. Preheat the grill on high for at least 15 minutes. Brush the grill grates with a paper towel that has been dunked in oil. 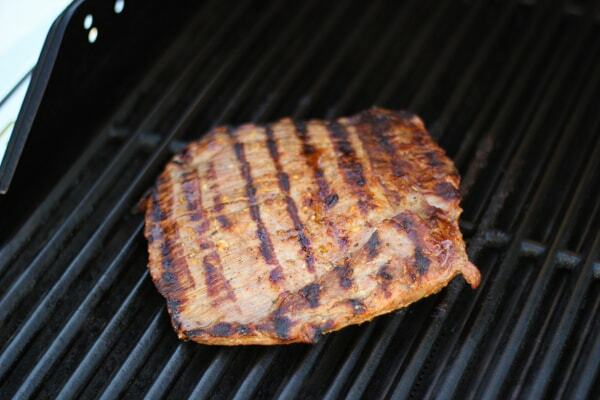 Place the steak on the grill and cook on high heat, covered, about 6-8 minutes. At this time, place the peppers and onions on the grill. Cook the veggies until they are golden with slight char marks. Flip them over and continue cooking on the second side until they are as done as you like them. It will be about 8 minutes total. 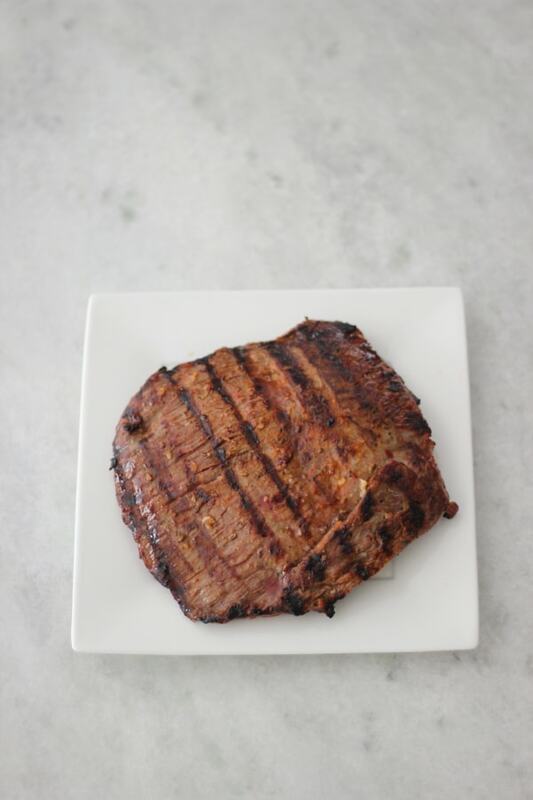 Flip the steak over and grill for 4-6 minutes on the second side. Take the steak off the grill, cover loosely with aluminum foil and set aside to rest for 5-10 minutes before slicing it thinly. Slice the peppers into large strips. 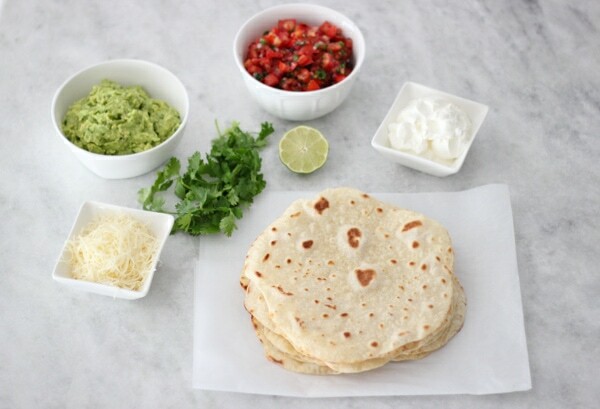 You can warm up the tortillas by grilling them for a minute or so on the grill, or use a skillet or microwave for half a minute to a minute. 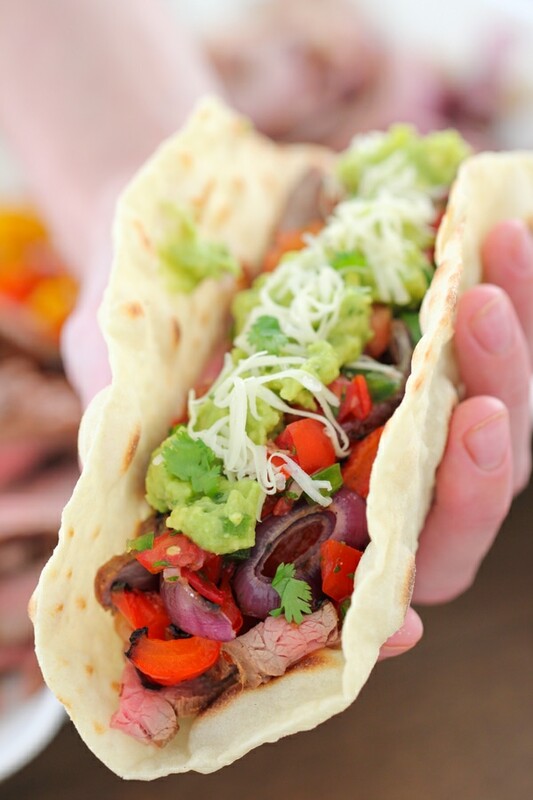 Serve the fajitas by placing the beef, peppers and onions on the warm tortilla and then load it up with all your favorite toppings. I like to set it up like a buffet, with the beef, peppers and onions together and then the tortillas and all your favorite toppings alongside. You can use plain chopped or sliced tomatoes and chopped/sliced avocado instead of the Pico de Gallo and Guacamole, if you’re short on time. 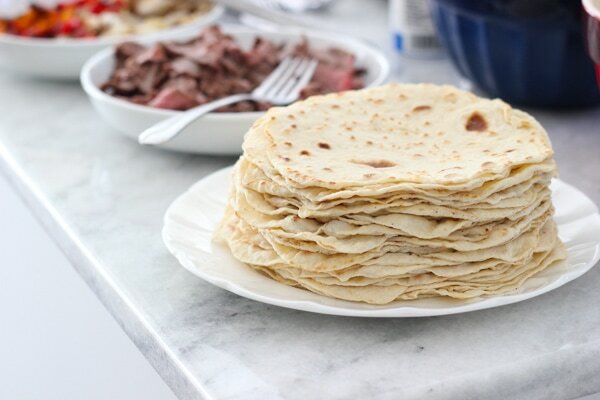 You can use store bought flour tortillas or make tortillas from scratch. I used this recipe that I found on Pinterest. At this time, place the peppers and onions on the grill. Cook the veggies until they are golden with slight char marks. Flip them over and continue cooking on the second side until they are as done as you like them, about 8 minutes total. 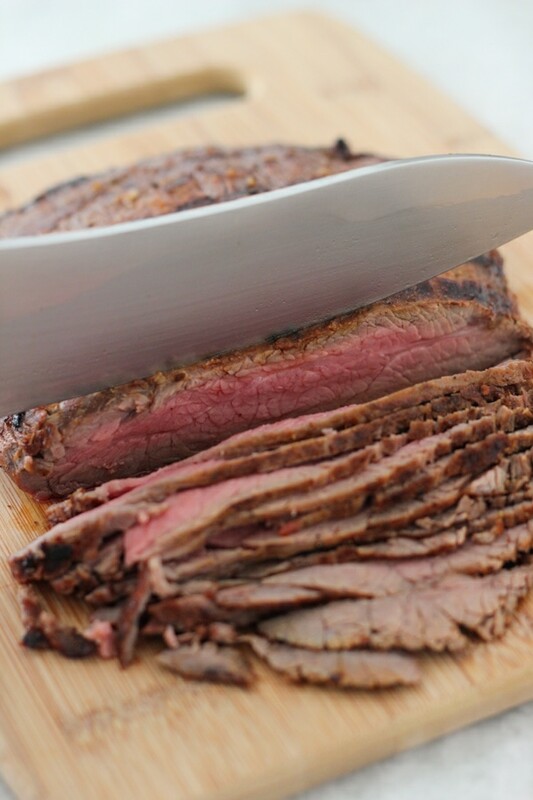 Flip the steak over and grill for 4-6 minutes on the second side. Take the steak off the grill, cover loosely with aluminum foil and set aside to rest for 5-10 minutes before slicing it thinly. You can warm up the tortillas by grilling them for a minute or so on the grill, or use a skillet or microwave for half a minute to a minute. 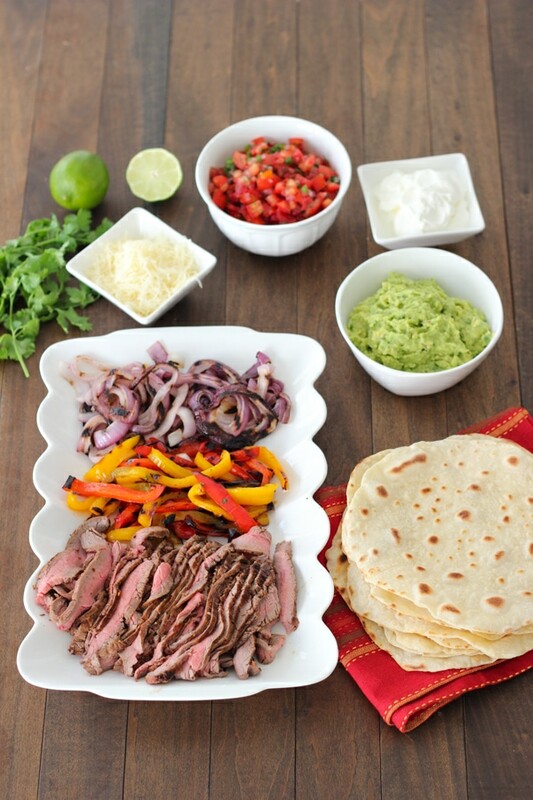 Serve the fajitas by placing the beef, peppers and onions on the warm tortilla and then load it up with all your favorite toppings. You can use plain chopped or sliced tomatoes and chopped/sliced avocado instead of the Pico de Gallo and Guacamole, if you’re short on time. I like to set it up like a buffet, with the beef, peppers and onions together and then the tortillas and all your favorite toppings alongside. We live in condo and grills aren’t allowed. This looks really good. Can’t I get away making steak and veggies in the oven? Do you have suggestions on that? Just wanted to let you know that I made these the first time and it doesn’t wasn’t such success because I didn’t let the meat marinade as long and I used store bought tortillas. I wouldn’t say it was terrible but I wasn’t too happy with the results. The second time I made these. I let the meat marinade for several hours and I made the tortillas from the recipe that you have link to. Oh what difference it made.. It was very delicious.. and I also had enough tortillas for next couple meals.. Thanks again for great recipes and your time! I’m so happy to hear that, Masha! 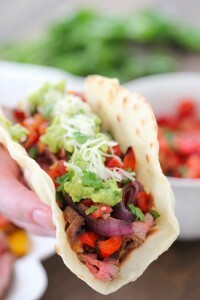 I agree that homemade tortillas really make a HUGE difference in how the Fajitas taste. 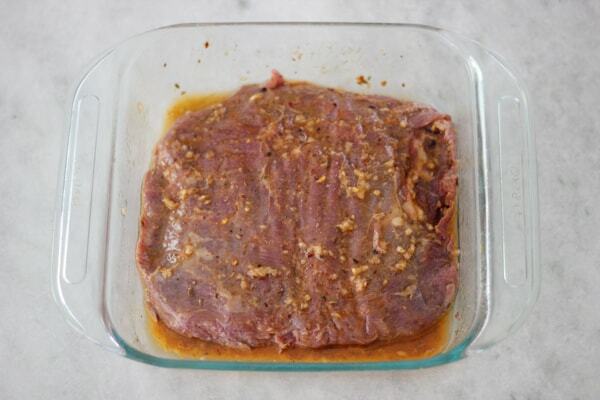 Marinating the meat for a long time gives it so much more flavor. I’m so glad you enjoyed it. Thank you for taking the time to write. I’m drooling all over my keyboard :). 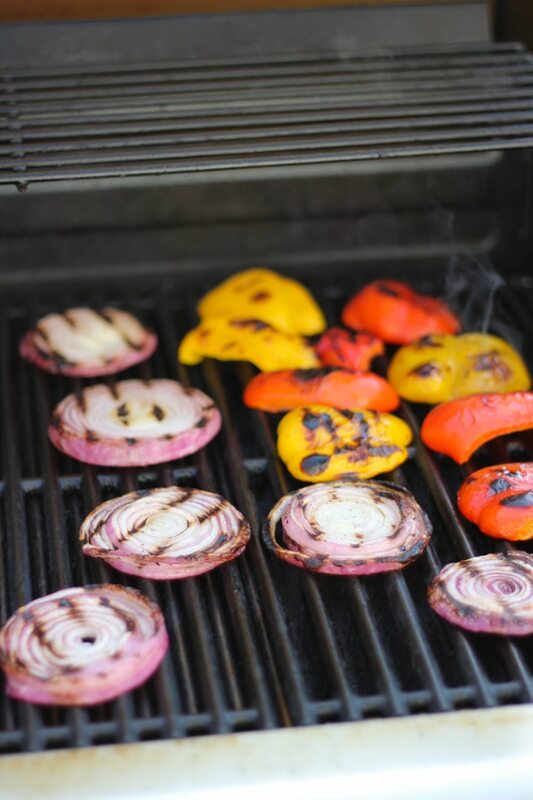 I love the idea of grilling onion and peppers, we usually just sauté them. Will be trying your way next time. These look amazing! 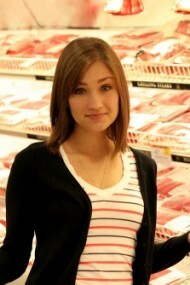 And a good way to stretch the meat as well. Will have to try it soon. Thanks for the recipe!